The Westlake High School Art Club is affiliated with the National Art Honor Society. Everyone is welcome, whatever your area or level of interest in the arts! Dues are $10 per year, and members need only to maintain a B average in any art class they are taking or have taken . Seniors in the NAHS are eligible to purchase the beautiful rainbow graduation cord for $12; the order is placed in March. Members of the Art Club are considered to be in good standing if they attend 4 meetings and/or events per semester. Our meetings are on alternate Wednesdays beginning on September 9. The first meeting is at 8:15 AM in Room 283 in the Visual Arts Building. Donuts are served! Other events that count as points toward membership in good standing include the Memory Project (portraits for orphans), gallery and museum visits, fundraisers, mural work, outreach to elementary schools and the community, and any other activities that the Art Club sponsors. Our executive board includes Simita Gaglani, Saarila Kenkare, Sydney Criswell, Grace Malerba, Finn Lowden, and Laura Jessich. 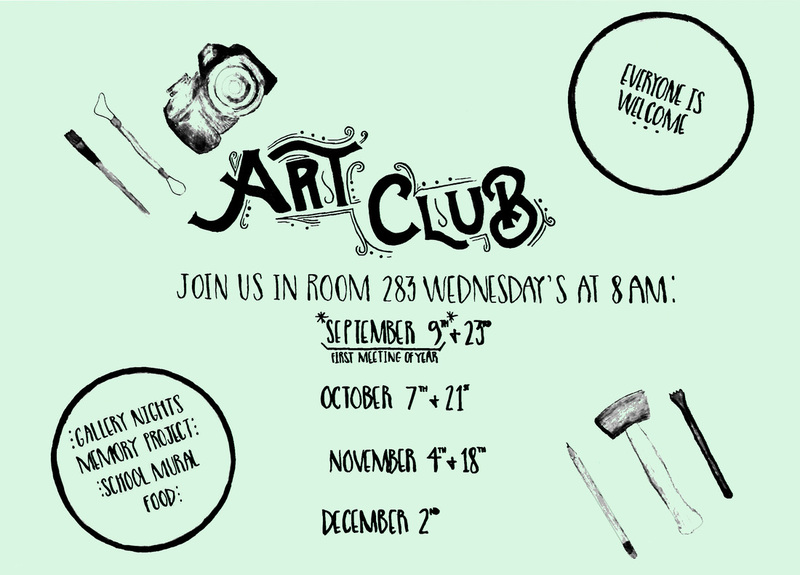 We look forward to seeing you at Art Club!